In the Star Wars series, Jedi Knights are depicted as dedicated students of a mystic power known as “the Force,” many using this power to help and defend those in need. 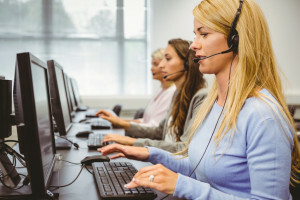 In fact, 3C Contact Services, the leading provider of customized call center solutions, sees parallels between the noble Jedi Knight and call center representatives (CSRs). Like the Jedi, CSRs have the power to help those in need; whether it’s with a simple inquiry or dealing with a difficult situation, they face these situations with the calm and grace of a Jedi Knight, deflecting any conflict that comes their way the same way a Jedi deflects laser beams with their lightsaber. But Jedis aren’t just about lightsaber duels; they also serve to mediate negotiations and conflicts in a civil manner, much like how a call center employee can deal with a difficult customer or client in a calm manner, all without having to resort to drawing their lightsaber, or in the case of a good call center employee, being harsh with the customer, which in turn might lead to lost business. If it comes down to combat, Jedis use their considerable martial art skills to end conflict, the lightsaber being called “an elegant weapon for a more civilized age.” Similarly, a CSR with exceptional customer service skills must be able to end any potential conflicts with customers in an elegant manner, rather than using the brute force of a blaster. A Code of Ethics: Like a Jedi Knight, call center employees are bound by a strict code of ethics that includes being peaceful and serene, no matter what the situation. Like how a Jedi is calm even if they’re dealing with a group of Stormtroopers or a Sith Lord, your CSRs should approach any conflicts in a similar manner. Morality: Jedi Knights are traditionally recognized as “the good guys,” the ones who save the day and stand against darkness, whether it’s the Empire or the Sith. Similarly, your CSRs must be the good guys for your clients, providing them with the support they need in times of crisis while being honest and up-front. A Sense of Honour: The Jedi have a sense of honour and nobility that is built around a set of rules and principles, similar to your own organization’s code of conduct. A good CSR will bring a sense of honour and nobility to their position, much like a Jedi Knight. Altruism: It can be easy to become jaded when dealing with customers on a daily basis. Jedis, however, always believed in and strove for the best outcome; so, too, should a good CSR. Commitment to Good: Like how Jedi Knights are dedicated to what’s best for the Republic in the prequels and the Rebellion in the original trilogy, your CSRs should have a similar commitment to providing the best service for your customers. Following these simple rules and avoiding giving into the “Dark Side,” which could cost your clients, and show how call center employees can learn a lot from Jedi Knights.